The Texas Ranger Hall of Fame and Museum education staff offers in-class presentations for groups of primary and secondary school-aged students. 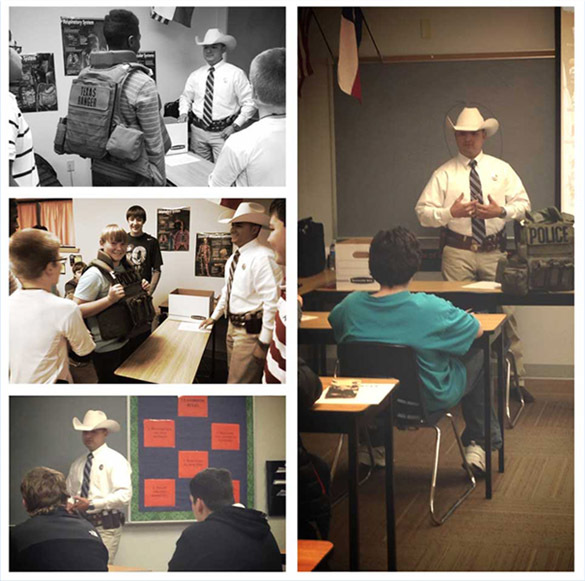 Presentations focus on the history of the Texas Rangers and their evolution from frontier defense to law enforcement. Programs include opportunities for hands-on interaction with reproduction artifacts with school administration permission. For programs taking place outside of McLennan County, a nominal travel fee based on current IRS mileage rates is assessed. For more information about school presentations, or to schedule a presentation for your class or school group, please download and return the presentation request form. Please note that school presentations are subject to staff availability and proximity to the Texas Ranger Hall of Fame and Museum in Waco, Texas. The education staff pledges to make every effort to participate in requested programs. Please keep in mind that peak request times include March, April and May. Available dates during these months often book several months in advance. For presentations by a Texas Ranger, please contact your local Texas DPS office.